Blogs and forums abound with discussions from mommy writers about how to address the urchins that run around interfering with our journeys toward bestseller-dom. Of course we love the brats. No questioning that at all. Like kittens, they’re cute and can’t help themselves. We write around them, knowing one day they’ll grow up and allow us more time to create. But what do you do when they are in their twenties and still in the way? And what about parents? Sisters, uncles and cousins? Once you publish a book or two, invariably your predecessors, successors, as well as those on the odd bent branches of the family tree, get in your way. And they are not as forgivable as kittens. When I released Lowcountry Bribe, the first in my Carolina Slade Mystery Series, family and friends devoured the book, pointing out which character was which relation, enjoying the inside joke they thought they knew. (Except for my mother, who ordered me never to write about her.) My son asked why I made him a girl. The assumption was I had to be the protagonist and my husband the romantic interest. They pointed out “errors” in the story, telling me my children were never kidnapped, so why put that in the book? I developed a list of one-liners in response to these reactions, the main one being, “It’s fiction, people. That means pretend.” They’d roll their eyes as if they knew better. The public, and therefore our relatives, think every tale of fiction is rooted in reality, and some instances probably are. We use our experiences as catalysts. But we avoid the use of clones, resumes, and biographies taken from our family tree for obvious reasons . . . hurt feelings, misunderstandings, and the potential for misrepresentation. But what is it about family fearing they are, yet wanting to be, subjects in a book? Maybe it’s that desire for the proverbial 15-minutes of fame. Maybe it’s a way of feeling honored by being blood-kin to a famous author (tongue-in-cheek there). Maybe they can’t let loose of reality to spin fable, and don’t understand those who do. 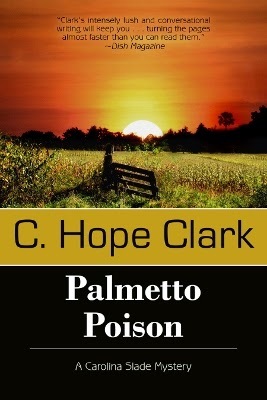 Palmetto Poison is Slade’s third story, and this time she is full-bore investigating the most complex case of her life. Enter her boyfriend, his ex-wife (also an agent), his sister, Slade’s sister, kids, and a complete family feuding cornucopia of families she investigates for murder, drugs, and political favors. Hope, this made me smile! I love that your family thinks they are in every book. My family has never said a word about it--does that mean they haven't read my book? :) Imagine that. Everyone says the front cover looks like I did when I was a girl but the artist and I did not know each other at all, so I think people are just looking for a resemblance. Anyway, congrats on your 3rd Slade book and like Sioux, I am also behind. But I have one of those urchins running around (and a dog, too) so. . .enjoyed this! It's funny how my family does all this. A new character in Palmetto Poison, Wayne's sister, is named after my sister-in-law because she whined I did not have a character for her. Her brother (my husband) said watch out what you ask for, because she could wind up being a crack whore or something. My SIL said that would suit her if the character is named after her. Well...guess what Wayne's sister was known for? LOL Can't wait for her to read it. She's already called, asking if she can preorder because she suspects she's in this one. Maybe my family is just crazy, but they all watch for their cameos in these stories. Hilarious, Hope! I gave a nod to a college mentor and recently sent him a copy of the book. He loved being included - and he even got to be the good guy!! Very funny! This was a great read, Hope. I have to admit I worry about my friends and family speculating on whether or not characters are based on them if any of my books ever get published! I'm behind and haven't read the Carolina Slade series but I have a huge Amazon gift card credit right now that should help me get caught up. I love a good mystery! Last fall I had an article in Quilters World. It was about some 1934 friendship quilt squares I have. I wrapped up the feature with some basic directions to make your own friendship quilt. I needed photos and examples -- so, of course I used a visit with my mom visiting my kids & grandkids for the photos in the quilt examples. My mom has gotten over three months of fame from this. She's in a square with my son & everyone she knows has seen the article. I don't think she knows what the article says (I know she does, she's my biggest fan), but everyone, including the ladies at church, the people in the copy/mail store, her manicurist, doctors office ... have ALL seen this article. Good idea Hope, maybe I'll have to put my mom in a book.